I guess it's hot and HyVee is clearing out all their plants. Gallon perennials were $2 this week, so I picked up everything I thought I could use. Also found 4" perennials at the hardware store for $.99. Picked up a dozen coral bells in a variety of colors, 4 hardy geraniums, 2 Mazus Reptans, and misc. veronica etc. Frankly I don't remember it all now. 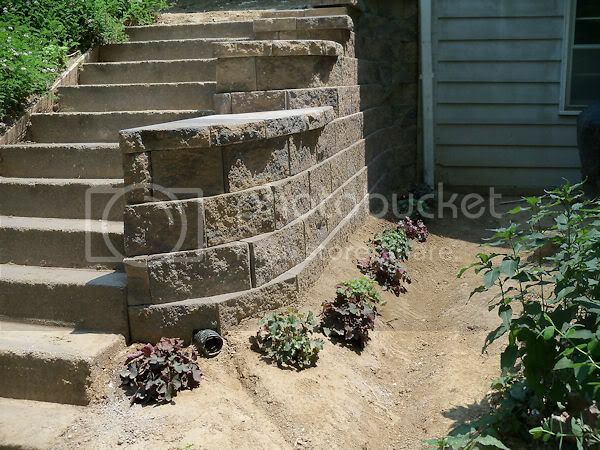 I decided to plant coral bells in front of the new retaining wall and keep it simple. Once it cools down, I'll transplant a low ground cover around them. Thinking about dead nettle or sedum, got plenty of both. The shade is starting to take over already at noon, but I tried to get a bigger picture of the area. You certainly managed to pick up more than a few bargains didn't you? I wish somewhere around here would have a clearnce sale of plants but, so far, no luck. I know I've said it before but I really like the new retaining wall. PL--I agree with Eileen. 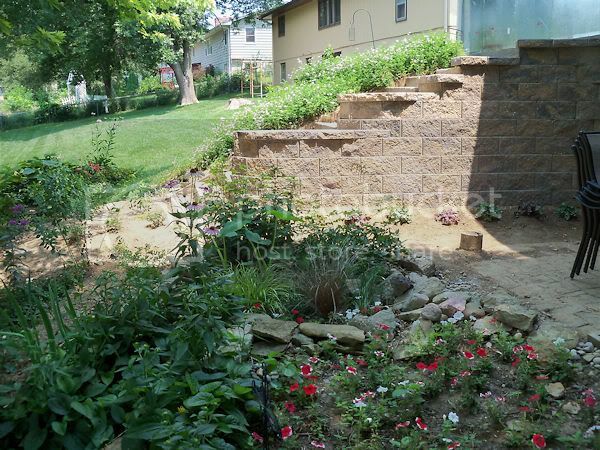 That retaining wall really looks great. I notice the drainpipe at the base. Good idea! I like the material you used and the larger capping stones on top give the wall interest. The coral bells should do well there!